There are literally thousands of Kolkata Durga Puja pandals but some stand out more than others, as a result of their captivating decorations. Every year they compete to outdo each other with the most elaborate and innovative themes. The pandals in north Kolkata tend to be more traditional, whereas the ones in south Kolkata are contemporary and showy. Do be aware that the popular, award-winning pandals get crowded though! It's not uncommon for serpentine lines to stretch a mile in the evenings on Saptami (seventh day of Navaratri), Ashtami (eighth day of Navaratri) and Navami (ninth day of Navaratri). However, these days many pandals open early and accept visitors from Sashthi (sixth day of Navaratri) or even earlier. See Navaratri dates here. Much of the crowd can also be avoided by visiting the pandals during the daytime. You'll miss out on seeing the spectacular lighting though. 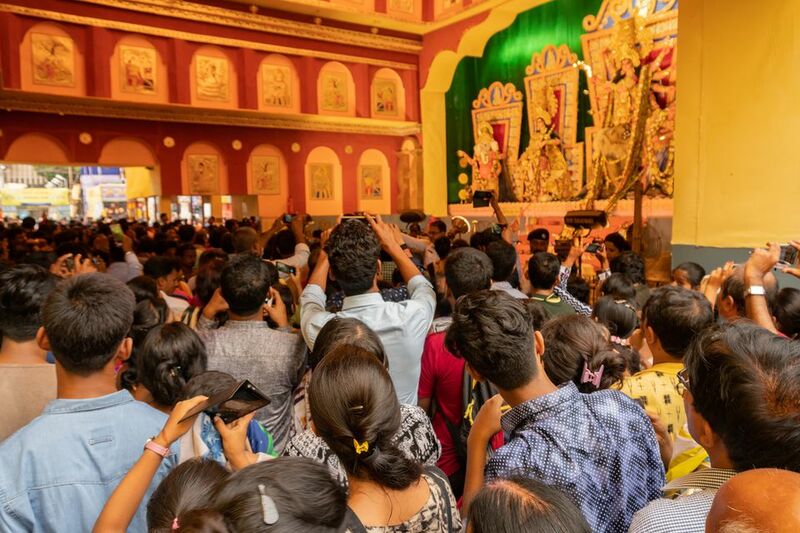 The easiest way to participate in the celebrations is to take a Durga Puja festival tour, such as the ones organized by the West Bengal Tourism Development Corporation (see list of tours and make online bookings here), Calcutta Photo Tours, Calcutta Walks, Walks of Kolkata, and Let's Meet Up Tours. More information abut Durga Puja, including tours, is also available on West Bengal Tourism's Durga Puja website. Alternatively, for something different, take one of the special puja tours by tram offered the Calcutta Tramways Company. Wondering where is best to stay? Try these 11 Convenient Hotels for Durga Puja in Kolkata. Bagbazar, one of the oldest Durga Puja pandals in Kolkata, is celebrating its centenary in 2018. The pandal is a relatively simple one with emphasis on tradition and culture. However, it always attracts attention because of its strikingly beautiful idol of Goddess Durga. An exhibition is held on its grounds, with carnival rides and stalls, as well. The sindoor khela ritual on Dashami (the last day of the festival), whereby married women place red sindoor (powder) on the idol before it's taken for immersion, is also renowned. People come from all over the city to see it. Location: North Kolkata, along the river in Bagbazaar. Near the Bagbazar Launch Ghat and Bagbazar Kolkata Circular Railway Station. The closest Metro railway station is Shayambazar. Kumartuli Park is a relatively young pandal, having been formed in 1995, but one that has become deservedly popular. It's particularly special because it takes place in the area where many of the Durga idols are handcrafted by professional clay modelers. The organizers believe in thinking outside the box when it comes to themes, featuring fusion art, so expect the unexpected! In 2018, the theme harks back to the time when Lord Krishna would play his flute for humanity. Location: North Kolkata, along the river at Kumartuli Park, just before Bagbazar (ideally, plan to visit both pandals). The nearest railway station is the Sovabazar Metro. It's also close to Sovabazar Launch Ghat. Established in 1948, College Square has a really picturesque setting beside a lake and the whole area is illuminated for the festival. Understandably, the crowd flocks to this pandal to see the sparkling lights and their reflection on the water. Location: Central Kolkata. 53 College Street. Near Kolkata University, off MG (Mahatma Gandhi) Road.﻿ The nearest railway stations are Mahatma Gandhi Road and Central Metro. As its name suggests, this pandal is located in a large park. It's another famous crowd-puller, with an elaborate display that showcases magnificent architecture of monuments. The puja was started in 1969 and the idol has a classic ethereal look. In 2018, the pandal is celebrating its 50th anniversary and features Chittorgarh fort in Rajasthan, inspired by the film Padmavaat. The inside is a replica of the courtyard from the fort's palace, while the overall structure is that of the main palace. Location: Central Kolkata. Opposite College Square, on Mahatma Gandhi Road (visit this pandal along with College Square). Originally founded in 1936 as "Sealdah Sarbojanin Durgotsav", it was renamed Santosh Mitra Square in 1996 and rose to fame in 1997 with a particularly innovative theme. The pandal has remained popular ever since and is known for its remarkable art work. You can expect to be dazzled! In 2018, the feature is a chariot made out of silver. Location: Central Kolkata, in the Bow Bazaar area. It's off BB Ganguly Street, not far from Sealdah railway station. The nearest Metro station is Central. Badamtala Ashar Sangha is a long standing Durga Puja pandal (around 75 years old) that also has a special place in people's hearts. From humble beginnings it grew to win an award for creative excellence in 2010. The pandal started experimenting with themes in 1999, and was one of the first in the city to do so. Since then, its themes have been diverse and captivating. In 2018, the theme is shob choritro kalponic (all characters are fictional). It's dedicated to women's empowerment and feminism. The idol has no weapons, to portray the message of peace and non-violence. Location: South Kolkata. Nepal Bhattacharjee Street, Kalighat. Right near the Kalighat Metro railway station and Rash Bihari Ave.
Suruchi Sangha entertains visitors with its arty outdoor display, themed on a different state of India each year. The Durga idols are modeled on how they look in each state as well. Although this puja pandal is more than 50 years old, it first found fame in 2003 when it won an award for the best decorated pandal. It won the award again in 2009. The craftsmanship is exquisite. In 2018, the eco-friendly and organic pandal has been made from soil collected from various districts of Bengal and the Siwalik Hills. The message is that preserving the soil will increase the longevity of human lives. Location: South Kolkata, in New Alipore near the petrol pump on Nalini Rajan Avenue (close to the National Highway 117 intersection). The nearest railways stations are Majherhat and Kalighat. Ekdalia Evergreen began in 1943 and has become well known for its outstanding replicas of temples from all over India. The decor and lighting is superb. The pandal also has one of the tallest Durga idols in the city. In 2018, the pandal has created a fiberglass replica of the Big Temple in Thanjavur, Tamil Nadu. Its traditional idol is dressed in a traditional Banarasi sari. Location: South Kolkata, in Gariahat. You'll find it near Mandevilla Gardens where the South Point Junior School is, off Rash Bihari Avenue towards Gariahat Flyover. The nearest railway stations are Ballygunge and Kalighat Metro. The spacious Jodhpur Park pandal is one of the biggest in south Kolkata. Its themes have been vast and varied, with some years more traditional than others. In 2014, it went hi-tech. The idol was created out of biodegradable materials by a 3D printer, which makes three dimensional solid objects from a digital file. It was the first of its kind in the world. Location: South Kolkata. The pandal is at Jadavpur Thana, Jodhpur Park, just off Gariahat Road South. (Jodhpur Park is close to Gariahat and Dhakuria). The nearest railway station is Dhakuria. Established in 1950, Bosepukur Sitala Mandir is a multi-award winning Durga Puja pandal, earning it quite a reputation as one not to be missed. It's a leader in unique and unusual themes, often depicting rural India. In 2018, the theme has been inspired by tribal tattoo art prevalent among the Gonds of Madhya Pradesh. Tribal artists from Amarkantak have used ropes, burnt wood and clay dolls to decorate the pandal. Location: South Kolkata, in Bosepukar, Kasba. Drive towards Ruby General Hospital from Gariahat and you'll find the pandal around midway, near Bosepukar petrol pump. The closest railway station is Ballygunge.